There’s been a lot of information about Jiren that I’ve been rehearing in my mind. Overall, I feel as if the entire Tournament of Power is a misdirect. We’re all being led to believe this is a tournament arc meant to lead to a final confrontation between Goku and Jiren in which, if Dragon Ball holds to its previous tropes, Goku taps into some deeper well of power and emerges the victor. Currently, many fans believe that to be Ultra Instinct. What if that’s all misdirection and this entire tournament is being built up to something completely different? Let’s take a look at Jiren and the story so far. First of all, let’s look at the character of Jiren. The anime has not done a good job characterizing him, but we can get a glimpse into his personality from the manga, remembering that both the anime and manga are drawing from the same source material provided by Akira Toriyama. From these screens, we know that Jiren is committed to creating a universe that’s safe. His commitment to the idea of justice is such that he won’t even kill bad people – not entirely different from Goku, but also many popular superheroes, and yes, that includes Superman. Despite Jiren’s commitment to the safety of people living in his universe, he’s also unwilling to wipe out another universe to safe his own. He perceives the two acts to be different – a cosmic act that wipes out his universe is a fate that could not be avoided. This is a look at Jiren’s character but also his resignation to the fact that even if he saved the universe for now, that doesn’t mean it will always be safe. It’s a cosmic occurrence beyond his control – only Zeno has that power, a capricious being with no morality that would be recognized by humans. However, we know that Jiren does have one wish, a wish that is never revealed. Jiren is a justice oriented character who is simultaneously resigned to the fact that there is a cosmic order that no level of strength can overcome. To get his ‘wish,’ he needs to something that lies beyond strength. All the training in the world won’t help him achieve what he wants. There are a few curious aspects of Jiren that should be noted. First, he has had multiple opportunities to ring out both Goku and Vegeta. In Episode 122, he could have done so to Vegeta, twice. He didn’t. Instead of eliminating Goku earlier in the tournament, he went into meditation and said the warriors he was needed for were no longer there. Many people took this as arrogance, but what if Jiren was trying to provoke Goku purposefully? 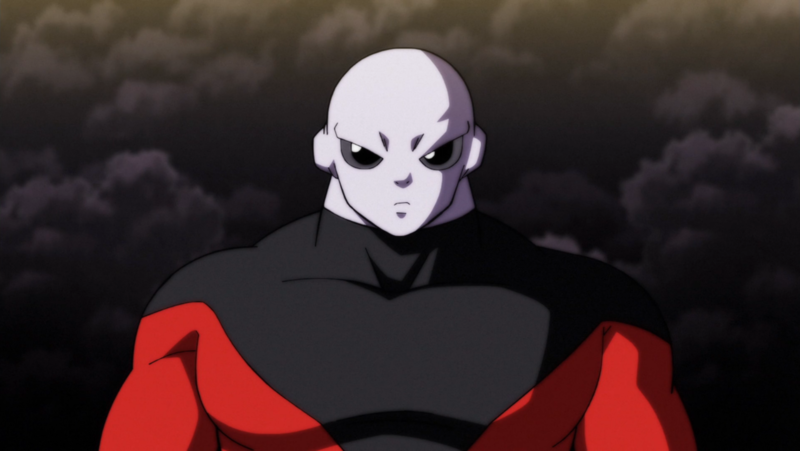 Throughout the tournament, Jiren has been more concerned with observing than fighting. He says in his fight with Goku that he’s looking for something beyond strength. He’s not concerned with ringing out either Goku or Vegeta. Vegeta tells Jiren that Jiren is fighting slower and weaker than he did against Goku, almost as if Jiren was letting Vegeta challenge himself. What if Jiren is genuinely interested in the Saiyans’ potential and wants them to get more powerful? Maybe he truly is above the God of Destruction tier but still finds himself at the mercy of the cosmic order and the Angels. We’ve already seen Vados and Whis act relatively unconcerned about the potential elimination of their universes. Anytime Beerus has seemed stressed about it, Whis has simply accepted the potential for them all to be wiped away (except for himself) as a simple part of the natural order. Vados did give a respectful bow to Champa, but it’s not as if she was broken up about her entire universe disappearing. This is an uncaring cosmic order in which the Angels, not matter how much we might like their personalities, aren’t particularly invested in the survival of the people that live in those universes. No matter how much Whis might like Earth’s food or Vados might enjoy banter with Champa, at the end of the day, they will (most likely) be around long after their respective universes are gone. The Angels aren’t anybody’s friends, not really, no matter how kind and respectful they might be in general. We have to remember these are entities far above the plane of mortals. And maybe Jiren understands that better than anyone and wants to break that current order. Maybe he’s looking for people like Goku and Vegeta that can break the current cosmic order, to tap into something beyond mere strength. We already understand the priority Jiren places on meditation. There have been moments in Dragon Ball Super our attention has been drawn to the spirit inside of people, not their ki. Even the first appearance of Super Saiyan God required pure spirit, not ki. Maybe the entire tournament is to emphasize that strength is not enough so long as the universe could be wiped out in a moment. They need more than strength. Jiren doesn’t quite know what that is, but he’s looking for it in people like Goku. He keeps provoking Goku into stronger and stronger feats as he searches for this quality beyond strength that could maybe be used to defeat the current cosmic order of Angels and Gods of Destruction over mortals – essentially waging a divine war to permanently secure the safety and lives of the mortals who live in the universes. The Super Dragon Balls could still play a role in that, wishing back all the universes that were eliminated – including his own, if that actually happened. But even then, their safety would still be precarious. Jiren needs to find something in people that goes beyond strength and that can be leveraged against the cosmic order. He thinks he sees something in the Saiyans that could help him in his cause, but whether that’s the case or not, we have yet to find out.